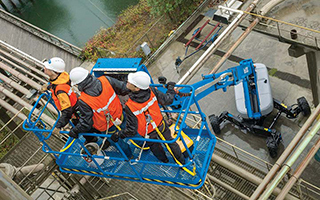 Genie® Lift Pro™ Online Operator Training Courses are high quality professional grade programs that are delivered through a web-based platform and are designed to satisfy the general training requirements for aerial work platforms as defined by ANSI, OSHA and CSA, and telehandlers as defined by ANSI/ITSDF, OSHA and CSA. The programs incorporate current adult learning theory and consist of detailed graphics, narration, video and a variety of quizzes that provide a rich and interactive learning environment for the trainee. At the end of the aerial program there is a 30-question exam to verify knowledge retention. The telehandler course consists of a 57-question exam. Upon passing the exam, a certificate of completion is presented as proof of training in preparation for the hands-on portion; after completing the online training, the trainee must receive hands-on familiarization from a qualified person to complete the training process and become a qualified operator.